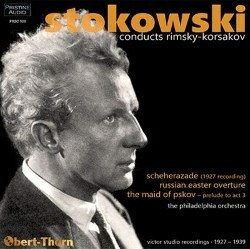 Stokowski and Scheherazade should go together like Love and Marriage. His 1934 Philadelphia reading is the pre-war version most commonly encountered at the moment though for some time it was surprisingly absent from the CD reissue marketplace, losing out to the 1927 recording under review. LP mavens will know his 1951 Philharmonia version, the 1964 Phase-4 with the LSO and the 1975 RPO, all subsequently released on CD. I find myself wavering between the 1927 and 1934 traversals. I’ve sometimes been put off by the battery of portamenti essayed in the later recording – not because I dislike the device in any way, rather because it sounds unremitting – whereas it has always seemed less pervasive in Stokowski’s first complete Scheherazade. Set against that this, the 1927 reading is very fast indeed, by some way his speediest reading. The basses are especially stygian as well, and concertmaster Mischa Mischakoff balanced behind the harp and a bit distant. In the ’34 reading Alexander Hilsberg was also rather backwardly projected, but he was heard to somewhat better advantage. The difference between the two violinists perhaps best exemplifies the subtle aesthetic differences between the performances. The earlier reading is graphic, intense, driven, passionate but occasionally rhythmically unsettled with Mischakoff’s virtuoso playing sounding just a mite self-regarding. Hilsberg, the less technically accomplished of the two, is the more romantic exponent. And one can’t help but finding The Young Prince’s flagrantly fast tempi just a bit too band-masterly for comfort. Articulation at this speed, even from this orchestra, is not easy. In years to come Stokowski took a more sensible tempo for this movement. There are two Scheherazade extras. There’s a first movement recorded five months before the complete recording that proves slower and more measured; it was never issued on 78s at the time. There’s also an alternative published take of one 78 side of The Tale of the Prince Kalender made two days after the main recording session. The Russian Easter Overture (January 1929) joins the 1942 NBC reading with baritone Nicola Moscona’s interpolations – probably Stokowski’s most exciting recording of this piece if you can take the use of the voice – and the 1968 Chicago version. And finally, there’s the stormy and evocatively played Prelude from The Maid of Pskov. The 1927 recording of the main piece has the usual ration of surface noise but has been well transferred here. All Stokowskians should welcome the chance to compare and contrast between the two shellac versions of Scheherazade. You can opt for the grand guignol ’27 or the more opulent, relaxed ’34, depending on the nature of your mood.